We have seen how Biofuels made from natural oils are being used an alternative to conventional diesel, largely by blending them with normal fuel. Let’s now look at what algae- the floating slimy green mass you see in seas and other water bodies, can do for us. During photosynthesis, algae capture carbon dioxide and sunlight and convert them into oxygen and biomass. The Biomass is then processed into biofuel, which can be used as an alternative to conventional fossil fuel. There has been a lot of research in synthesizing biofuel from Algae, as a unit of equal mass can produce up to 10-100% more oil than other biofuels such as Jatropha, sugarcane etc. Also, up to 60% of the Algae yield can be converted into fuel, when compared to 2-5% from other plant sources. A test conducted by Solazyme- a company involved in fuel extraction from Algae, in association with the US navy had powered a container vessel with 100% algae fuel in its voyage from northern Europe to Indonesia, which was a complete success. 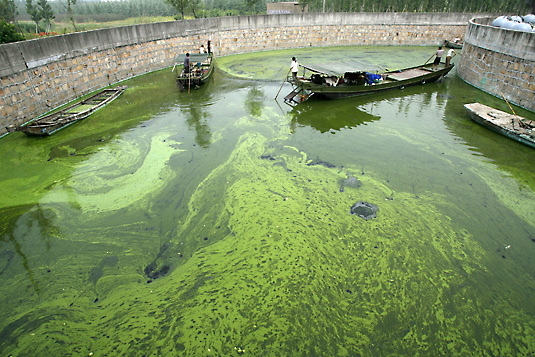 Algae can be cultivated in sea water, as well as normal wastewater ponds, and when it’s harvested, it releases CO₂ into the atmosphere, which again is absorbed by the algae farms, thereby causing no significant increase in co₂ emissions. Under controlled conditions, algae can produce up to twice more oil per acre then compared to other fuel crops such as soya bean and Jatropha. It has a very short cultivation period of 1-10 days, which enables much more returns then other fuel crops. It can be grown in marsh waters, seas and also in saline lands, and would not displace other food crop cultivations. However, the yield would decrease while being cultivated in an arid land. There is an ongoing research to optimize the required resources for such cultivation plants, as they require significant investment. Also, bio researchers are currently looking at isolating certain algae strains which give a comparatively higher yield, and are resistant to common bacteria and harsh climate conditions. The United States Department of Energy estimates that if algae fuel replaced all the petroleum fuel in the United States, it would require a total cultivation area of just 15,000 square miles which is only 0.42% of the total U.S. land area. The larger picture which the world now needs to look at is isolating and developing alternate energy sources, and effectively integrating them with energy consumers such as automobiles before the crude oil resources start depleting. Such a research though at an initial stage, has deep rooted practical implications for all of us in the world.